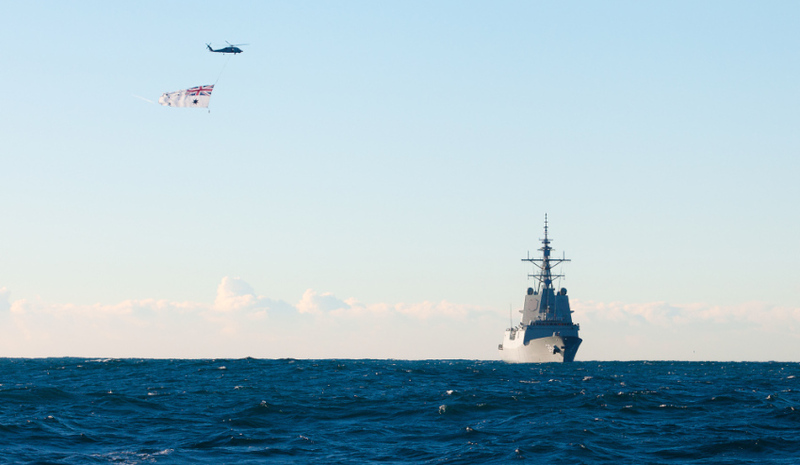 A Royal Australian Navy S-70B-2 Seahawk Helicopter flies the Australian White Ensign over NUSHIP Hobart as she sails towards Sydney Harbour for the very first time. Image via Commonwealth of Australia, Department of Defence. The removal of the Air Warfare Destroyer project from the projects of concern list has put the focus back on the future of ASC. The project, which was placed on the 'shame list' in 2014 due to increasing commercial, schedule and cost risks, is now back on track and meeting targets under the reformed budget and timeline.The turnaround has now renewed calls to have ASC included as builders on upcoming naval projects. The first AWD, HMAS Hobart, was commissioned into the Royal Australian Navy in September last year, with the second and third ships to be delivered this year and next. Acting CEO for ASC Shipbuilding Jim Cuthill said the decision "really hit home with each of our staff, and their families, who have been diligent in their pursuit of improvement, and resilient as the project overcame its initial challenges and continued working as part of an effective AWD Alliance team to successfully deliver the Navy’s most potent and complex warships". Margot Forster, CEO of Defence Teaming Centre (DTC), congratulated ASC for its part in the turnaround of the SEA 4000 project. "The removal of the Air Warfare Destroyer project from the projects of concern list is a major win for Australian industry and further recognises the significant productivity improvements by ASC," said Forster. "The decision to remove the project recognises the incredible work and expertise of ASC, the work force and the broader Australian supply chain." Forster said if the government hopes to develop a truly sovereign shipbuilding capability for Australia, ASC must play a key role. "ASC, as a truly Australian shipbuilder, is critical to the development of a genuinely sovereign shipbuilding capability in this country," she said. "When given the opportunity, Australian industry has proven its ability to meet and exceed world’s best practice in shipbuilding, as evidenced by today’s announcement and the Collins Class submarine sustainment program." The future of ASC beyond the Air Warfare Destroyer project and the first two Offshore Patrol Vessels remains unclear, with the government refusing to mandate the use of the sovereign shipbuilder in the upcoming SEA 5000 Future Frigate and SEA 1000 Future Submarine projects. This decision has come under fire from Labor and Nick Xenophon Team senators in recent months, with calls being made to alter the tender arrangements for SEA 5000.